This blog is very eye opening about piracy. So far, that I know of, I’ve had one book be sold by an unauthorized person. It’s certainly given me something else to look for. Great job. I’ve already written about piracy. Twice, in fact: in Har! 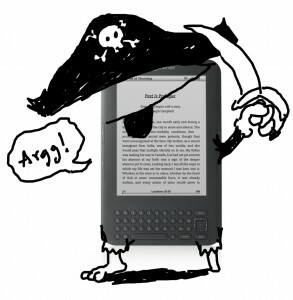 How to Deal with Book Piracy and in Should I fear Piracy? Insights from the PWC report. In both cases, I advised people to keep calm about it. There is a kind of piracy that ticks me off, though. That of people copying your book and passing it off as their own. The Digital Reader recently posted about an author, Scot Schad, who discovered that pirates had been ripping off freely available and open source digital textbooks, and then using Amazon’s POD service to sell print versions on Amazon. The scammers identify a popular textbook, copy the name, and then start selling the paper copy of a pirated book under that name. They’re hoping to sell the pirated book to an unwary buyer who might mistake the knockoff for the legit textbook. I wish I’d had this blog before I did my first interview. This is full of valuable info. Thank You. Performing on radio and podcasts like a professional requires preparation and practice. Before you arrive at or call in to the radio station or the podcast show, be sure you’ve gotten everything together. Don’t listen to yourself later and wish you could do it over. There will be many things you’ll forget to say and even more you’ll wish you had emphasized, but if you follow some simple tips, you’ll reduce those ‘woulda, coulda, shoulda’s’ to a minimum. Radio shows and podcasts can take place anywhere in the world. Make sure you know what time it will be at the host’s location. As I write this, it’s 11:00 a.m. in Chicago and 5:00 p.m. in London. 2. Listen to a previous show to get an idea of your host’s style. All writers dream of knocking out thousands of words a day, publishing multiple books a year and seeing them all skyrocket to the top of the bestseller lists across the country. We dream because it’s a difficult task and not everyone has the drive to take the right steps. But of the people who do, they generally have instituted these 10 habits into their writing life to make sure that they are giving themselves the best chance to write something great. Here are the good habits you should develop and add in your writing life if you want to find success.